Bailong Hu and Haiyan Zhou contributed equally to the letter. This comment refers to the article available online at https://doi.org/10.1007/s00540-018-2582-9. In a randomised controlled trial by Naja et al. 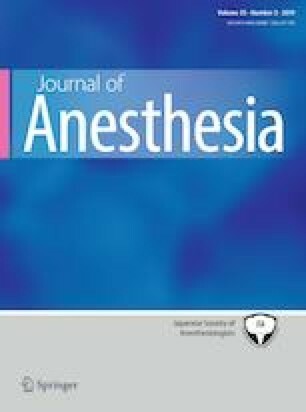 comparing the effect of three paravertebral (PVB) injections versus five injections for elderly patients undergoing inguinal hernia repair surgery, they showed that the five PVB injection technique was more suitable as a sole anaesthetic technique for elderly patients undergoing herniorrhaphy. However, we note several aspects of this study that need to be clarified and discussed. As was described in Table 2, the number of failed block between the two groups was analysed by the Chi squared test and the P value was 0.024. However, we calculated using Fisher’s exact test, the P value was 0.059, which means differences between the two groups were not statistically significant. We find that there were more than 20% of cells with an expected value of less than 5 for the “failed block”. In this case, Fisher’s exact test should be used rather than the Chi squared test . Moreover, the concentration of bupivacaine between the two groups was 0.5% (group III) and 0.3% (group V), respectively. To our knowledge, concentration of local anaesthetic is an important factor that may influence the effect of PVB . Thus, we suggest that the concentration of bupivacaine should be equal between the two groups. Otherwise, it is not convincing to believe that five PVB injections provided better anaesthesia when compared with three PVB injections without providing the above information.